Get away from Chicago,IL, for a weekend of swimming in indoor & outdoor pools, relaxing at a spa, skiing, a game of golf, boutique shopping and museums. Many nearby hotels, resorts and romantic inns offer affordable room rates and seasonal packages. Whether you are looking to relax on the beach, hike, bike, or go on a fun shopping trip, there is plenty to choose from. We've included diverse day trips and weekend getaways from Chicago, Illinois for couples and families. Grand Geneva Resort and Spa is one of the best weekend getaways from Chicago for couples, conveniently located between Chicago and Milwaukee, offering a getaway filled with romance and adventure. The property has golf courses, fitness center and a spa. If you are planning a family trip, Moose Mountain Falls Waterpark offers 50,000 square feet of heated watersides, tubing on the lazy river, hot tubs and lounge chairs. Other activities include lake cruises, tours of the historic downtown and shopping. In the winter, The Mountain Top offers downhill skiing, snowboarding and cross-country skiing. Romantic weekend specials start at $80 per person. Located 30 minutes from downtown Chicago, the Hilton Chicago/Indian Lakes Resort offers 225 acres of fun, including scenic golf, indoor and outdoor pools, and luxurious spa treatments. Many dining choices are available, whether you want a romantic dinner for two or a family restaurant. If you are looking for affordable weekend getaways, nightly rates start at $129, including free internet access. If you are looking for resorts near Chicago that offer deals, Hilton Chicago Indian Lakes often offers special packages for families. 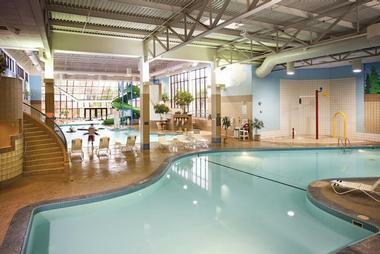 Located on 1,400 acres on the shores of Lake Michigan, Grand Traverse Resort and Spa is a popular spot for families. There are four 18 hole golf courses, including The Bear designed by Jack Nicklaus, The Wolverine by Gary Player, and Spruce Run by William Newcomb. For those who wish to improve their game, the Jim McLean Golf School can help golfers of any level get even better. There is a 100,000 square foot spa complex which features treatment space, workout facilities and a tennis center. Arrive early for your treatment to enjoy the sauna, two indoor swimming pools, four whirlpools and the relaxation room. Play tennis, work out and take a yoga class to improve your fitness. The resort offers three accommodation choices: condominiums, rooms in the hotel or the seventeen-story Tower with views of Lake Michigan. The 236 condos, located either on the fairways or the beachfront, all have a furnished dining area, kitchenette, a living room with a queen-size sofa sleeper, and a bedroom with a queen-size bed. The condos are great for families. Rooms in both the Tower and in the hotel have elevated views of the lake and are centrally located near the restaurant, the spa, and the Tower Gallery of Shops. Guests can select from three restaurants, the Trillium Restaurant and Lounge located on the 16th and 17th floors of the Tower, the more casual Sweetwater Café, and the Grille at the resort's clubhouse. Summer is the best time to go because the warm weather enables guests to try out all of the resorts activities. If you are looking for last minute weekend getaways from Chicago, be sure to ask about seasonal deals, specials and packages. The Abbey Resort is a full service getaway on 90 scenic acres near the Fontana harbor, offering 334 deluxe guestrooms, 13 spacious suites and 13 villas. 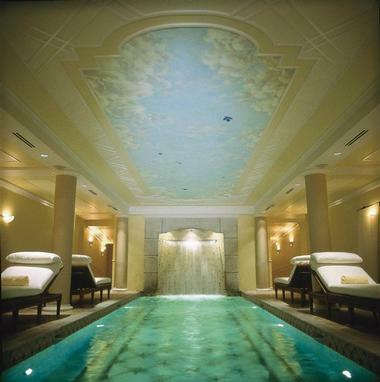 The 35,000-square-foot Avani Spa offers massages, facials, wraps, aromatherapy and saunas on your weekend trip. Resort facilities include a fitness center, aerobic studio, indoor and outdoor swimming pools, a disk golf course, and a games arcade for kids. Dining options range from casual cafes to gourmet restaurants, including 240 West, Café Latte, the Waterfront Restaurant Bar & Grill, Bar West and Porto. Weekend activities include watersports, bike rides, golf, walking and jogging around the lake. If you are looking for affordable resorts near Chicago, rooms start at $89 per night. Egg Harbor, the Newport Resort is a great choice for family vacations and romantic retreats. Sandy beaches, world-class golf courses, and state parks offer plenty of outdoor entertainment during the summer, and cross-counting skiing, snowshoeing, and sledding in the winter. Rooms start at $79 per night. The Knickerbocker on the Lake is a restored boutique hotel located in the heart of downtown Milwaukee. The property is within walking distance of a number of restaurants, museums, theaters, and transportation options. The 160 guest rooms and suites are decorated with period-influenced furniture and modern conveniences such as fully equipped kitchenettes and Wi-Fi. Some suites have views of the picturesque Lake Michigan shoreline. The full service Knick Salon and Spa offes invigorating treatments, while the Juneau Room is a spacious area ideal for hosting special events. Guests can work out at the 24-hour fitness center, request custom tailoring and valet dry cleaning. The Knick Restaurant offers upscale dining, with a menu that provides something to suit every gourmand. Weekend guests should not miss the bountiful Sunday brunche. If you are looking for cheap weekend getaways, rooms start at just $119 per night. If you are looking for romantic places to visit near Chicago, SevenOaks offers 9 adult-only luxuriously appointed cottage suites. The one-floor buildings have charming front porches, stone fireplaces, comfortable living rooms, and king-sized beds with luxury linens. The garden has a soothing water feature, fire pit and comfortable lounging chairs. 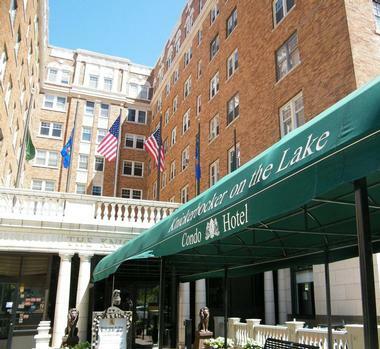 Just a short walk from downtown Lake Geneva, guests have easy access to a number of restaurants. Play a round of golf, visit a day spa, go biking, hiking or skiing in the winter. Rates start at $179 per night. 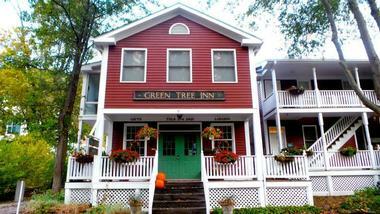 With its location in historic Elsah, the Green Tree Inn is surrounded by a choice of things to do. The surrounding valley is quiet and gorgeous, perfect for relaxation. There are five rooms in the inn, each with a unique relaxing atmosphere. They all have air conditioning and private baths, and most have a queen bed although one has two double beds instead. Most rooms have TVs as well. There is a communal satellite TV, Wi-Fi throughout the property, an antique room, a fireplace, board games, a deck with beautiful views, and bikes to borrow. You can also have an in-room massage. Guests have access to a fridge with water and soda as well as homemade afternoon snacks and coffee, cider, hot tea, and cocoa. A homemade breakfast is included, and you can also enjoy a homemade evening meal if you would like. Rates start at $135 per night. 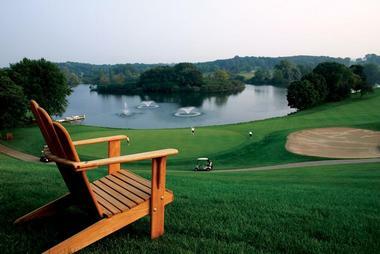 The American Club, Kohler is one of the most famous resorts near Chicago, offering two accommodation options: The American Club and the more affordable Inn on Woodlake. About two and a half hours from Chicago, this beautiful resort offers great outdoor activities in the summer, and pools and spa relaxation in the winter. Look for couples, family and golf packages, including golf academy especially for women, golf specials, and more. The Kohler Waters Spa is a destination for the senses, featuring a glass enclosed rooftop deck with a whirlpool, fireplace and lounge. Try the newly renovated couples suite for a relaxing side-by-side massage and other treatments. Yoga on the Lake is a premier yoga studio offering 20 classes a week. The Washington House Inn in Cedarburg, Wisconsin, 110 miles north of Chicago, offers stylish accommodations, complimentary, afternoon complimentary wine and cheese social hour and free high speed internet access. Explore Cedarburg's Main Street with more than 70 boutiques, shops selling sweets, and restaurants. The town has several museums: the General Store Museum, Kuhefuss House Museum and the new Wisconsin Museum of Quilts and Fiber Arts. Try the Deluxe Package with rates from $250. The package includes: Overnight lodging in any room, Evening social hour in our Gathering room, featuring local wines and cheeses, $100 Spa service certificate at one of the local spas; and Deluxe continental breakfast in the Gathering Room or room service to your room. 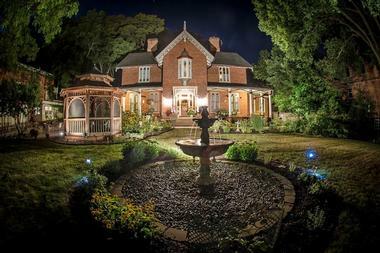 The Mansion Bed and Breakfast is located 35 miles to the west of Chicago and gives you the chance to relax on a private estate built in 1907 on your weekend trip. You will find breathtaking stained glass windows, original lighting, and exquisite woodwork throughout the rooms and common areas. Every room has wireless internet, a cable TV with a VCR, premium pillow top mattresses, Egyptian cotton sheets, an iron with ironing board, a hair dryer, and a desk. There are extended stay options available. 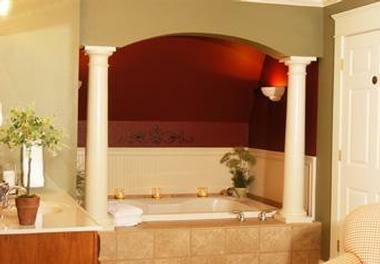 Some rooms also have two-person Jacuzzis, private baths, private terraces, and electric fireplaces for added romance. Guests have access to the extensive video library, board games, and magazines. There are snacks and tea available during the day. A spa, numerous restaurants, and bike trails are just a few minutes away, many of which are within walking distance. Rates start at $139 per night. 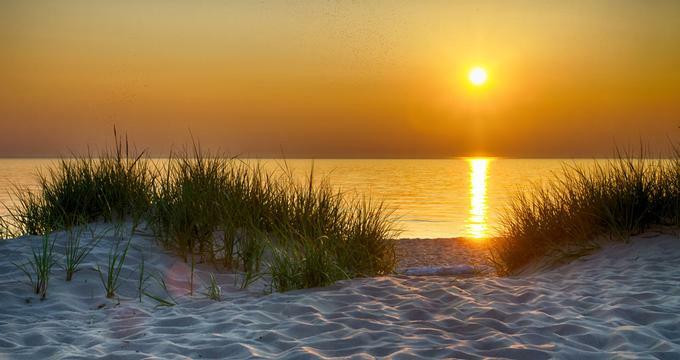 Sweethaven Resort sits on 9 picturesque wooded acres near Lake Michigan beaches, in beautiful Union Pier Michigan. The resort offers 5 spacious family-friendly cottages, each with screened porches, hot tubs, full bathrooms, and kitchens. Tastefully decorated, the cottages are pet friendly. 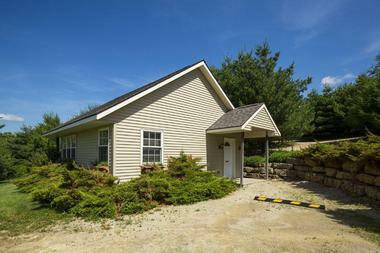 The property is perfect for taking long walks through the woods, or relaxing in the sun at a nearby beach. Guests can take advantage of the fully equipped kitchens in the cottage, or head into town for a diverse selection of dining establishments. Shopping opportunities abound, with outlet stores and charming boutiques offering something unique and interesting for all. Explore art galleries, visit a museum, try water sports on Lake Michigan, play golf and get a massage at a nearby day spa. Keep reading for more weekend getaways near me. Hawk Valley Retreat & Cottages is only eight miles from downtown Galena and has ten acres of secluded gardens and meadows to explore. There are four private cottages and three rooms within the main house. The main house rooms have private entrances, private baths, satellite TVs with DVD players, and wireless internet. All cottages have whirlpool tubs, Wi-Fi, air conditioning, TVs with DVD players, full baths, electric fireplaces, king-size beds, sitting areas, eating areas, kitchenettes, and private porches. One of them also has a separate bedroom. Bishop’s Hall was built in 1916 and features Georgian revival style architecture and sits in historic Oak Park. All rooms are decorated in the Georgian style. There are three guest rooms to choose from, each of which is unique and features a private bath and queen-sized four-poster bed. Amenities vary by room but some have balconies, separate dressing rooms, marble baths, fireplaces, multiple seating areas, claw foot tubs, steam rooms, and European hand showers. Every room has toiletries, hair dryers, and robes along with chocolates and fresh flowers. Guests can enjoy the garden and terrace. The morning begins with a full breakfast available in one of several rooms, giving guests the option of being social or enjoying a private meal. You can eat breakfast on the balcony or terrace in nice weather. Rooms start at $175 per night. Keep reading for more resorts near me. 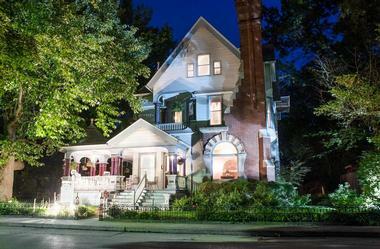 The Vrooman Mansion is a historic bed and breakfast right in Bloomington/Normal. The historic estate offers luxury and privacy with easy access to attractions, restaurants, and shops. The majority of the decorations in the spacious guest rooms are antique period furniture, with each room featuring its own theme. The suites have down pillows, soft fluffy towels, high-quality linens, microfiber robes, and free Wi-Fi. 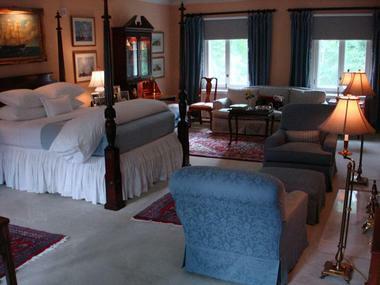 There are five suites and rooms in the Mansion and two in the carriage house. The numerous common areas include the Safe Room, the Library, the Foyer, the Music Room, the Dining Room, and the Parlor. Throughout the day, you can enjoy bottled water, soft drinks, and snacks and a full gourmet breakfast is included in every stay. Breakfast features tea, coffee, or cocoa, juice, fruit, and a hot entrée. Rates start at $110 per night. 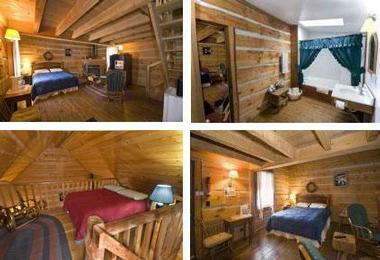 Galena Log Cabin Getaway covers 45 acres of secluded land as well as the Adventure Creek Alpaca and Labradoodle Farm. This working farm has 12 log cabins, each with one room and over 660 square feet plus an open loft. There is a modern bathroom featuring a six-foot double-whirlpool tub and large skylight. Cabins have a queen bed downstairs with a double bed in the loft, satellite TV, a fridge, a microwave, and a gas log fireplace. Other amenities include DVD players, central air and heat, and platform rockers. Four of the cabins are dog-friendly. While at this inn, you can visit or enjoy the alpaca farm, and even take an alpaca for a walk. They also breed Goldendoodles, which guests can spend time with. Guests can hike 1.5 miles along the Adventure Creek or head to Casper Bluff or along the Mississippi River. There is very little light pollution in the area, which means gorgeous views of the stars on clear nights. Rates start at $189 per night. 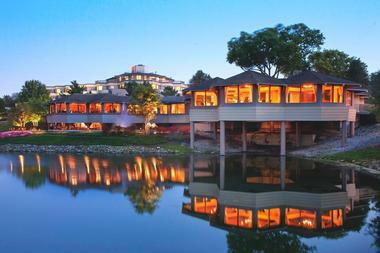 The Mission Oak Inn is home to a seven-acre lake that is perfect for watching migrating birds or going fishing. The suites have warm fires in the fire places when you arrive and there is a whirlpool that fits two people. Suite amenities vary by room, but can include two-sided fireplaces, custom-built tables and beds, satellite TVs, DVD players, CD players, wireless internet, reclining loveseats, porches, fridges, and microwaves. There are hiking trails throughout the 120 acres of property. While walking along, you will notice wild turkeys, coyotes, foxes, and deer. You can even borrow the inn’s canoe to explore the lake. The day starts off with a gourmet breakfast right in the dining room and you can enjoy dinner in the on-site restaurant. There are add-on packages available, such as in-room massages. Rates start at $175. The Steamboat House is a short block away from Main Street in Galena and offers easy access to shops, restaurants, wineries, and more. There are five guestrooms with private baths, fireplaces, fine linens, LCD televisions, and DVD players. 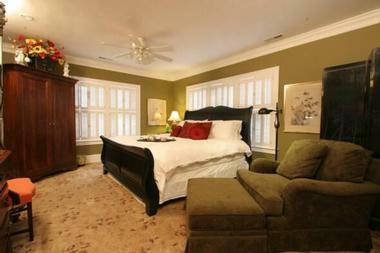 Room decorations vary with some featuring four-poster beds, original hardwood floors, sleigh beds, and private porches. Guests can enjoy the billiard room, library with games, books, and movies, wraparound front porch, screened garden gazebo, or cozy parlor. There is wine every evening with hot beverages at night. In the morning, cocoa, tea, and coffee are delivered outside your door and a three-course breakfast is included. Guests can also add various packages that include in-room massages, birthday cake, wine, flowers, chocolate, and/or visits to local wineries. If you are looking for cheap weekend getaways from Chicago, rooms start at $115 per night. The Market Street Inn is inside a historic Queen Anne Victorian building built in 1892. The ten guestrooms are inviting and filled with modern amenities. Rooms and common areas have antiques, Oriental rugs, pocket doors, and beveled glass windows. To get to the eight guestrooms, climb the grand oak staircase. The rooms have private baths, double-whirlpool tubs, complimentary Wi-Fi, cable TV, and air conditioning. 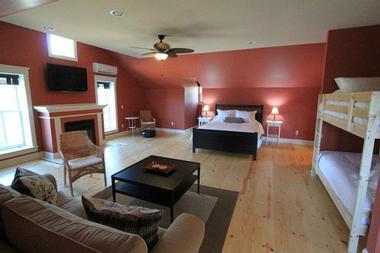 The two guest rooms in the Carriage House include a deluxe suite and an ADA-approved one with a kitchenette. Each room in the Main Inn has a fireplace. Guests have access to the Victorian wraparound porch, perfect for looking at the gardens. There are six original fireplaces throughout the inn. There is a social hour in the evening with fruit, cheese, and beverages and in the morning, guests can enjoy a candlelight breakfast. There is also complimentary soda and bottled water. Rates start at $150 per night. TimberCreek Bed & Breakfast is an upscale bed and breakfast in a building that was built specifically to appear like a barn. It is on a 25-acre property with a gate at the end of a picturesque winding lane surrounded by a stream and trees. The English Cottage décor spans the common areas and guest rooms with tile, brick, and hardwood floors, fireplaces, skylights, upscale furnishings, over-sized beds, artwork, and a Jacuzzi. Each guest room has its own bath and there is Wi-Fi throughout. A suite is handicapped accessible. Guests can request access to hair dryers, irons, and laundry facilities. The Gathering Room is relaxing with floral couches, leather recliners, a stone fireplace, games, and magazines. The Breakfast Room hosts the morning breakfast and the Kitchen has tea and coffee. Rates start at $99 per night. 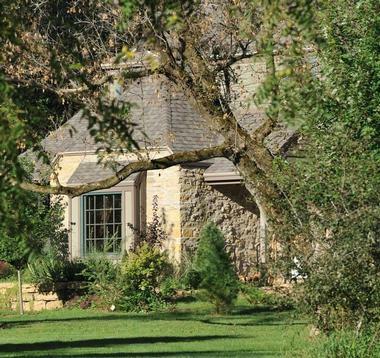 Irish Hollow is a beautiful bed and breakfast perfect for a romantic getaway that sits on a 500-acre farm. Guests can choose to stay in one of the five private cottages or one of the guest rooms in the Main Inn. These cozy, intimate rooms have iron or claw foot bathtubs, enhanced showers, a sitting area, gas fireplaces, and modern amenities. The cottages vary, but may have king four-poster beds, oriental rugs, private porches, double whirlpool baths, iPod docks, Wi-Fi, and more. You can also have body work done at the inn. Breakfast is included with your stay and it is hand-made using natural ingredients. You can choose a continental breakfast delivered to your room, the Full Country Gourmet Breakfast in the Old General Store, or a healthy version of this full breakfast. Guests can also order additional meals, including picnics, wine and cheese. Dinner packages start at $345 per night. Farmers Guest House is located in historic downtown Galena, giving guests easy access to nearby attractions. Each of the nine rooms and suites is tastefully decorated, providing an intimate setting perfect for couples. All rooms have flat-screen TVs with Blu-Ray/DVD players to watch movies from the inn’s collection and there is Wi-Fi throughout the property. Other room amenities include private baths, luxurious bath amenities, individual outlets, irons, hairdryers, and plenty of outlets. The common areas include the Spa Studio, private gardens, and numerous patios. In the morning, guests enjoy a full breakfast with a signature entrée, homemade pastries or bread, fruit, juice, and homemade granola. There is also Wine time every evening with cheese and wine, as well as fresh cookies at night. Guests have access to soda, tea, coffee, and bottled water. Rooms start at $179 per night. 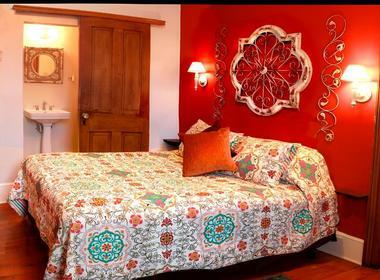 This three-room bed and breakfast provides an intimate setting for couples or very small groups to escape. Guests say they enjoy a similar experience to that of a boutique hotel, but nestled among towering trees and stately homes. Every room has a private bath, luxury bed linens, memory foam mattresses, HDTVs with DVD players, complimentary Wi-Fi, a CD player and radio with alarm clock, hair dryers, irons with ironing boards, premium toiletries, towel racks and heated floors in the bathroom, turndown service, and guest robes. Guests have access to an extensive DVD collection, the library/sunroom, the deck, and the garden patio. 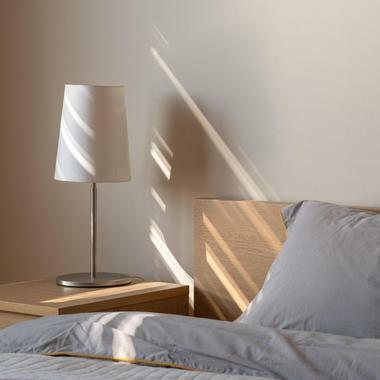 The bed and breakfast is just a few blocks from Cedarhurst Center for the Arts with its exhibits and sculptures or you can go to Rend Lake for golfing, hiking, boating, and water skiing. There is a full cooked breakfast every morning. Rates start at $129 per night. Located in downtown Madison, Wisconsin, the Mansion Hill Inn is a historic getaway with luxurious guest rooms featuring Frette linens, high-definition flat screen televisions, rain fall showers, and Aveda bath products. If you are planning a romantic getaway, ask for one of the suites with whirlpool baths, in-room gas fireplaces, and access to balconies or verandas with a view. Take advantage of the Pre-Arrival Concierge to customize your stay at the Mansion Hill Inn. Dunes Walk Inn is a charming restored 1881 mansion on the Lake Michigan coastline, featuring hardwood floors and vertical mullion windows. 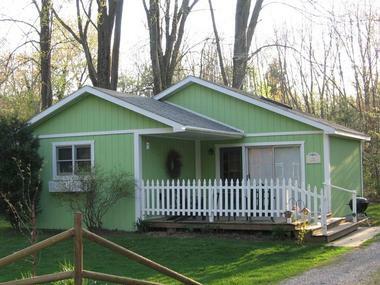 Explore Indiana Dunes (about 50 miles from Chicago) and stay at this family friendly inn which sleeps 19 guests. Rates start at $125 per night. Elkhart Lake in Wisconsin is an ideal getaway destination for all nature lovers and water sport enthusiasts, boasting crystal clear lake water and an abundance of activities suitable for all ages. You can choose from a variety of accommodation options which vary from up-market resorts and vacation rentals to getting back to nature at the Broughton March Park campground, where you can pitch a tent or park your RV. Water sports are the most popular summer activity and if you do not have your own equipment you can hire everything you need to enjoy the lake from Osthoff Resort Water Recreation Rentals or at Victorian Village Resort. You can try your hand at canoeing, kayaking, water skiing or simply enjoying the beautiful lake-side scenery on a pontoon cruise. Ecology Outfitters Guided Silent Water Tours provide equipment and lessons for beginners. The lake is famous for great fishing - Inland Waters Fishing Guide Service or Jay's Guide Service will lead the way. Back on dry land you can explore the shores by horseback with Camp Anokjig Trailrides, do a Backroads Bike Tour (or simply rent a cycle at the Osthoff Resort) or go hiking along an abundance of trails. Speed enthusiasts can watch motorsports or enjoy various adventure programs at Road America. In winter the emphasis changes to cross-country skiing, snowshoeing and snowmobiling. Door County in Wisconsin is situated on a peninsula which juts out into Lake Michigan and boasts over 300 miles of shoreline with beaches, bays and inlets waiting to be explored. Sun worshippers have an astounding 53 public beaches to choose from and if you would like to go boating there are 12 marinas where you can launch your own craft or charter one. In addition to the shoreline there are also 3 inland lakes where you can enjoy fishing, canoeing, kayaking, kite-surfing, scuba diving and paddle boarding. You can learn all about the history and culture of Door Country on one of the many interesting tours available, which include helicopter tours, scenic cruises, bike tours, segway tours and trolley tours. The beautiful natural scenery of has attracted many resident artists and you can visit their galleries or get your own creative juices flowing by attending a workshop. History buffs have the opportunity to visit no less than 11 historic lighthouses, and at the Door County Maritime Museum you can learn about World War II ship-building in Sturgeon Bay. Other interesting museums include Corner of the Past Museum in Sister Bay, Door County Historical Museum in Sturgeon Bay and the Alexander Noble House Museum in Fish Bay. Door County is a famous cherry growing area and if you time your visit carefully you can enjoy cherry blossom time (April) or cherry picking time (July). Lake Geneva is a resort town situated on the shores of Lake Geneva in southern Wisconsin, offering a great base for exploring the many lake-side activities. The lake has been a summer holiday destination since just after the Civil War and there are many historic stately homes starting with Black Point Mansion, which was built back in 1888. 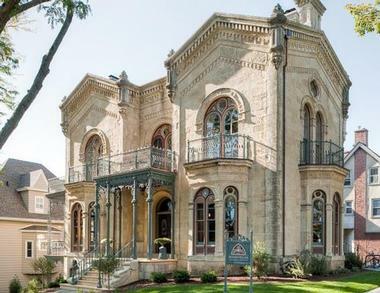 You can admire several of the homes on a lake cruise with Lake Geneva Cruise Lines and learn all about the early days at the Geneva Lake Area Museum of History. Energetic visitors can walk the beautiful 21 mile Lake Geneva Shore Path, go zip lining on a Lake Geneva Canopy Tour or with Aerial Adventures, who also have a Vertical Playground for climbing enthusiasts. The lake offers many options for water sports and you can hire all the equipment you need from several outlets including Elmer's Lake Geneva Boatline, Inc. Other exciting activities you can try are hot-air ballooning (Lake Geneva Balloon Company) and guided fishing expeditions with Dave Duwe's Guide Services. Golfers can play a round at several courses and after an active day you can relax at one of several Spas in the area. Foodies can have the time of their lives at the Lake Geneva Farmer's Market and Studio Winery, or take a class at the Lake Geneva School of Cooking. If you would like to try something really different on your next weekend getaway try a visit to Indiana's Amish Country, where you can step back in time and find out all about the Amish way of life. A good place to start your weekend would be at Amish Acres in Nappanee, where you can take a guided tour of the historic farm and homestead, enjoy the family-style Threshers Dinner (and a wine tasting) and watch a performance in the Round Barn Theater. Quilting demonstrations and horse and carriage rides are available. To find out more about Amish quilt-making you can take a self-guided drive along the Barn Quilt Trail to see around 37 barns, each of which feature a unique quilt square pattern. Between May and October you can drive the 90 mile Heritage Trail to see 19 amazing quilt gardens in full bloom. The area is bristling with parks where you can go hiking or biking and you can also enjoy canoeing and kayaking on the St. Joseph River. There are several golf courses for you to enjoy and many boat-launch sites if you would like to do some fishing. In winter the emphasis changes to ice-skating and cross-country skiing. Amish Country has a vibrant art scene and you can visit several galleries and attend live theater at the Elkhart Civic Theatre, the Lerner Theatre and Premier Arts Inc.
Nestled on the shores of Lake Michigan, Saugatuck is renowned as a hub for artists, and also has a long list of activities to appeal to all ages, from relaxing in the sun on Oval Beach to getting active on the water. There are several choices when it comes to water sports - you can go sailing at Saugatuck Yacht Club or Sweetwater Sailing Charters or try your hand at fishing on an expedition with Lakeshore Charter Boat Association or Michigan Fishing Charter Co. There are numerous scenic cruises available and other unusual activities include Saugatuck Dune Rides and Saugatuck Photographic Workshops. Budding artists can attend a hands-on workshop at the Ox Bow School of Art or the Express Yourself Art Barn – you can get those creative juices flowing by taking a stroll around town to visit more than 10 unique art galleries which showcase local talent. Foodies can visit Crane Orchards and Cider Mill, Fenn Valley Vineyards and Winery or go on a Hungry Village Tour to sample the best of local cuisine. 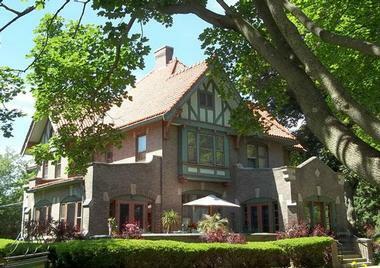 There are also some historic attractions you can visit including the Felt Mansion, the Old Schoolhouse History Center and the Saugatuck/Douglas History Museum. The river-side city of Milwaukee is jam-packed with interesting, educational and fun activities to fill every moment of your weekend getaway. One way to get your bearings is to go for a stroll along the two-mile RiverWalk, which features public art installations, shops, pubs and restaurants. If you need a little guidance from a local, you can go on a Milwaukee Food and City Tour (either on foot or by bus), to combine a little history with a lot of great local flavor. Other foodie favorites include the Palermo's Pizza Factory Tour and a visit to Purple Door Ice Cream. History enthusiasts can take a stroll along Brady Street to see plenty of historic architecture and visit the North Point Lighthouse Museum. No city visit would be complete without exploring the Historic Third Ward which has been transformed from a disreputable rough area into a trendy Art and Fashion District, home to the Broadway Theatre Center, the Milwaukee Institute of Art and Design and the Milwaukee Public Market. If you need to get some exercise you can walk, jog, cycle or go boating in the Lakeshore State Park, an urban oasis along the shores of the lake. Gardening enthusiasts should not miss the Mitchell Park Horticultural Conservancy. There plenty of family-friendly attractions including the Manfred Olson Planetarium, the Milwaukee County Zoo, Discovery World and the inter-active Betty Brinn Children's Museum. Indianapolis is famous as the home of the Indianapolis Motor Speedway, but aside from motor sports the city has many other historic and cultural activities to suit all tastes. 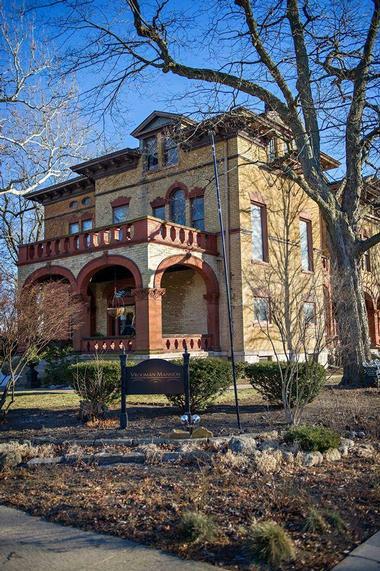 You can learn about local history by taking a walking tour of the Lockerbie Square Historic District and visiting some historic homes such as the James Whitcomb Riley Museum Home, the Benjamin Harrison Presidential Site and the Oldfields–Lilly House and Gardens. Outdoor enthusiasts can head to the Canal and White River State Park in downtown, where you can walk, jog or cycle the three mile Canal Walk loop, or visit Eagle Creek Park which boasts zip-lines, a golf course, several trails, a swimming beach and various water sports. You can embrace the cultural side of the city by visiting the amazing Indianapolis Museum of Art (which has a permanent collection of over 54,000 works by many famous artists), the Eiteljorg Museum of American Indians and Western Art, the Indianapolis Art Center and the G.R.T. Glass Design Studio. Petrol-heads will probably head straight to the Indianapolis Motor Speedway and Hall of Fame Museum - you can even treat yourself to a thrilling Indy Racing Experience on the track. Families can have hours of fun at the Indianapolis Zoo, the Space Quest Planetarium and at Go Ape Treetop Adventures. Time seems to have stood still in Galena, whose huge 581 acre historic district seems little changed in 200 years. The Galena-Jo Daviess Country Historical Society leads a variety of events including Historic Home Tours and Galena Cemetery Walks and there are several historic homes open to the public including the Ulysses S. Grant Home, the Elihu B. Washburne House and the Old Market House, which now operates at the Galena Welcome Center. History buffs can also visit the Galena History Museum, the Old Blacksmith Shop (a working forge) and Dowling House which dates back to 1826 and once housed visiting fur traders. For a change from historic sites you can head to the Casper Bluff Land and Water Reserve for great views and hiking/cycling trails. You could also take a stroll through the West Street Sculpture Park to see many installations by local artist John Martinson, and visit his on-site studio. You can also see some of his work in Linmar Gardens, together with several themed gardens, fountains and natural waterfalls. If all the walking has left you thirsty you can visit Galena Brewing Company or Galena Cellars Winery, and perhaps round off your busy day with a magic show at P.T. Murphy Magic Theatre. In winter head to Chestnut Mountain Resort, a favorite skiing and snow-boarding destination. Springfield is the capital of the state of Illinois and welcomes visitors to a wealth of historic, cultural and outdoor activities. The city is most famous as the home of President Abraham Lincoln and you will find historic sites linked to the Lincoln family around every corner - you can start by visiting the Lincoln Home National Historic Site, the Abraham Lincoln Presidential Museum and Library, the Lincoln-Herndon Law Office and the Lincoln Tomb. If you are interested in historic architecture you can tourt the Clayville Historic Site (a stagecoach stop dating back to 1824), the Elijah Iles House, the Edwards Place Historic Home and the impressive State Capitol Building. Several guided tours are available or you can do things at your own pace on a self-guided tour. Springfield also has a vibrant arts scene to explore - you can visit the Springfield Art Association and the Hoogland Center for the Arts to admire visual art, and enjoy the performing arts at the Springfield Theater Centre, the Legacy Theatre, the Illinois Symphony Orchestra or the Springfield Ballet Company. Outdoor activities include hiking in the Adams Wildlife Sanctuary or at the Lincoln Memorial Garden and Nature Center or boating of all descriptions at the Lake Springfield Marina. There are several local wineries you can visit and children will enjoy an outing to the Henson Robinson Zoo and have plenty of fun options at Knight's Action Park. Ann Arbor is an excellent weekend getaway destination, boasting great museums, restaurants, vibrant culture and a great selection of outdoor activities. The city is home to the University of Michigan, one of the country's most prestigious public universities and many of the attractions can be found on the extensive university campus - student-led campus tours are available. A few of the excellent museums you can visit include the University Of Michigan Museum Of Natural History, the Gerald R. Ford Presidential Library and the Kelsey Museum of Archaeology. You can enjoy the visual arts at the University Of Michigan Art Museum or listen to a wide range of musical genres at the University Of Michigan School Of Music. The Hill Auditorium, Michigan Theatre and the Kerrytown Concert Hall are all great entertainment venues featuring everything from Broadway musicals to opera and ballet. If you would like to watch a game at the largest stadium in the United States you have come to the right place – Michigan Stadium was built in 1927 and plays host to a variety of sports. You can go sledding and ice skating in Buhr Park in winter or hiking, cycling, fishing, boating and bird watching at the Hudson Mills Metropark. Families should not miss a visit to Ann Arbor Hands-On Museum for hours of interactive fun promoting literacy and science.